A recessed bathroom medicine cabinet does a great job of giving your bathroom an organized look. 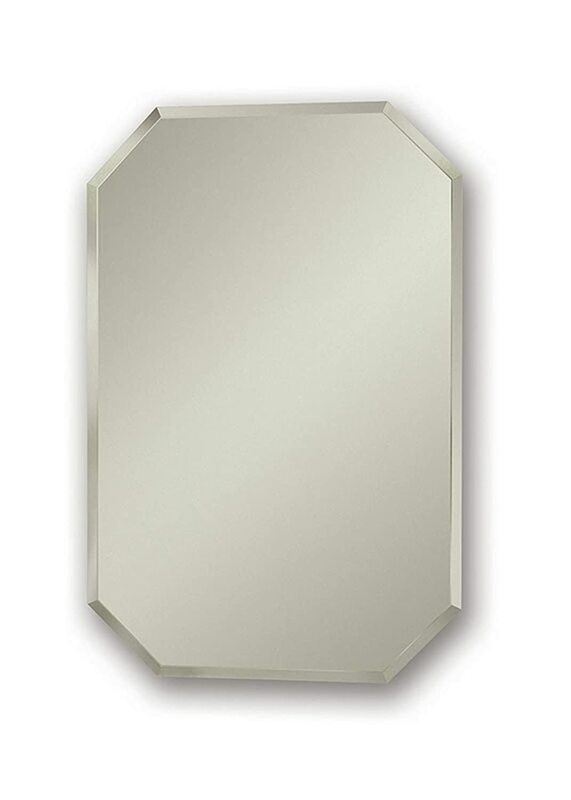 The mirror or sleek surface material such anodized aluminum that covers the front of a recessed cabinet breaks the monotony in bathrooms. If your bathroom looks plain or is cluttered and lacks storage space for medicines and toiletries, a recessed cabinet will help you change this. Traditionally, to incorporate a recessed medicine cabinet in an existing non recessed wall meant a whole load of unpleasant work, involving digging deep into the wall to achieve recess. At times it also involved relocation of pipes in the wall and so forth. You would then need to involve a carpenter to design and create a fitting cabinet. Well, in 2018 this is not the case anymore. Functions as a bathroom decor: A recessed cabinet is part of the decor and adds glamorous to your bathroom. It may be completely flushed with the wall or may protrude out of the wall by several inches offering design options. Easy to install options: The good news now is that the recessed cabinet you buy already has precise measurements. Your involvement of a carpenter in installation is diminished or entirely removed because you now just buy from a vast range of design selections. Although some recessed cabinets are exclusive to recessed installations, some do provide an option of a surface mount which is less involving. Different designs and features to chose from. Another benefit with modern recessed cabinets is that the design is already done for you in different sizes with excellent interior quality materials and features such as tempered glass and bevel mirror on the surface door. If you don’ mind the slight protrusion of your cabinet from the wall, the surface mounts are less hustle and might work for you. If you prefer your medicine cabinet completely recessed and flush with the all, then only a recessed installation will do. 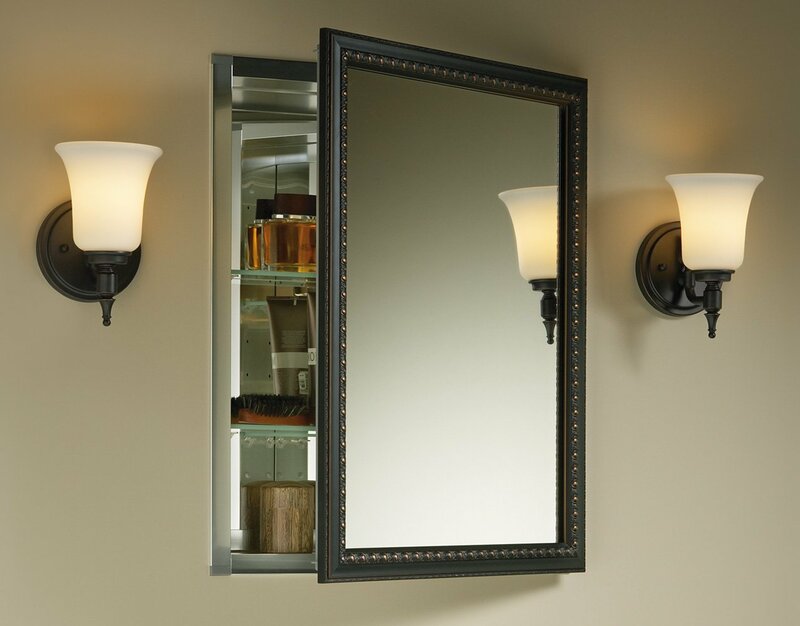 Below, we have rounded up some of the best elegant recessed medicine cabinets that you can find in the market today. The Kohler brand is renowned for its quality products. The design on this cabinet is superb as it features a beveled mirror inside the front door as well as inside the back of the cabinet. The same door that has the mirror can be installed to open right or left depending on preference and space. This is a good feature as it provides room for maneuverability depending on the complexity of the installation space. The exterior construction boasts of anodized aluminum that is rust proof and does not chip. This cabinet comes with a fully mirrored interior which is classic and provides improved visibility. The 2 shelves are adjustable and made of tempered glass. They can be customized to your liking to fit toiletries and medicines. Mounting this cabinet will require you or your contractor to chip away at the wall and achieve an approximate recess of 35/8 Inches deep, 14 inches wide and 18 inches high. Customers who purchased this unit loved the overall frame-less design and relative ease of installation. This product has a sleek frame-less exterior design that is consistent with most contemporary bathroom designs. The front door bevel edge is 1/4 inch and the exterior is anodized aluminum that is durable and rust proof. Also, your bathroom looks great for the long haul as the exterior does not chip. There is full-overlay mirror on the inside surface of the front door. The door can be hinged on either side depending on your convenience. It lights up very well and has 2 tempered glass adjustable shelves. The door opens at 108 degree angle allowing easy access. This unit comes in several sizes to suit the nature of your bathroom. For installation, your contractor will need chip away at bathroom wall to achieve a rough recess of about 3 5/8 inches deep, 19 1/4 inches wide and 25 1/4 inches high for proper installation. Consumers loved the versatility of this unit as it includes a side kit that allows for both recessed and surface mount installation depending on your preference. 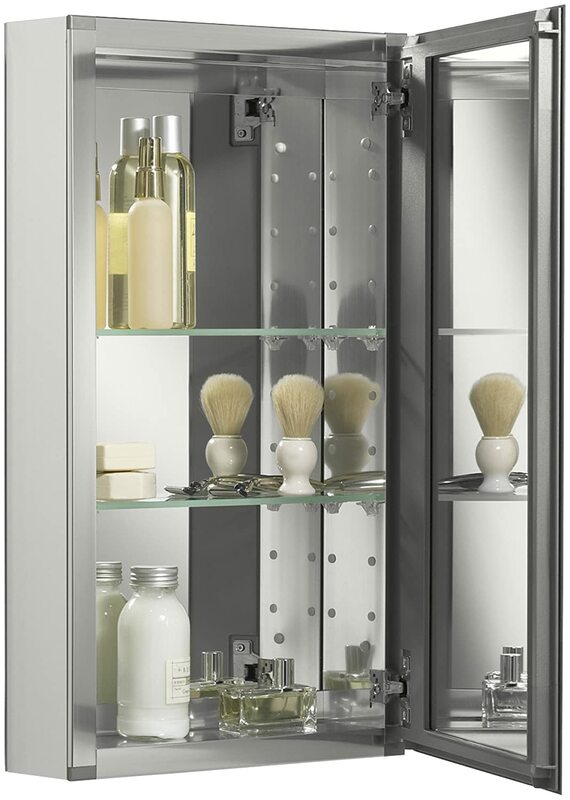 The archer mirrored cabinet instantly brings a touch of class to any bathroom and at the same time un-clutters it. It features classy hidden storage and the arching beveled door design on the upper and lower part is pretty stylish. This is the cabinet for those who want to break way from the standard rectangular look. The exterior of the whole cabinet is anodized aluminum so you don’t have to worry about chipped edges or rust. The interior of the front is overlayed with a full mirror and so is the back. It comes with two adjustable shelves made of tempered glass. This means you can customize shelf height to accommodate longer medicine bottles as well as create space for toiletries amongst other items. The visibility inside the cabinet is fantastic as the mirrors are designed to reflect light around the cabinet. Installation is fairly simple since this unit provides you an option of recessed installation or a surface mounted installation. It comes with the hardware for both options. Recessed installation will require 19 inches wide x 25 14 inches high x 3 15/16 inches deep opening on the wall. Consumers loved the different surface door design. The difference that this product brings to your bathroom, is outstanding in terms of both design and practicality. This product has managed to eliminate the biggest worry in a wet area such the bathroom by using anodized aluminum. Now, rust and chipping are the least of your worries. The slim fit and beveled edges exude simplicity and class. 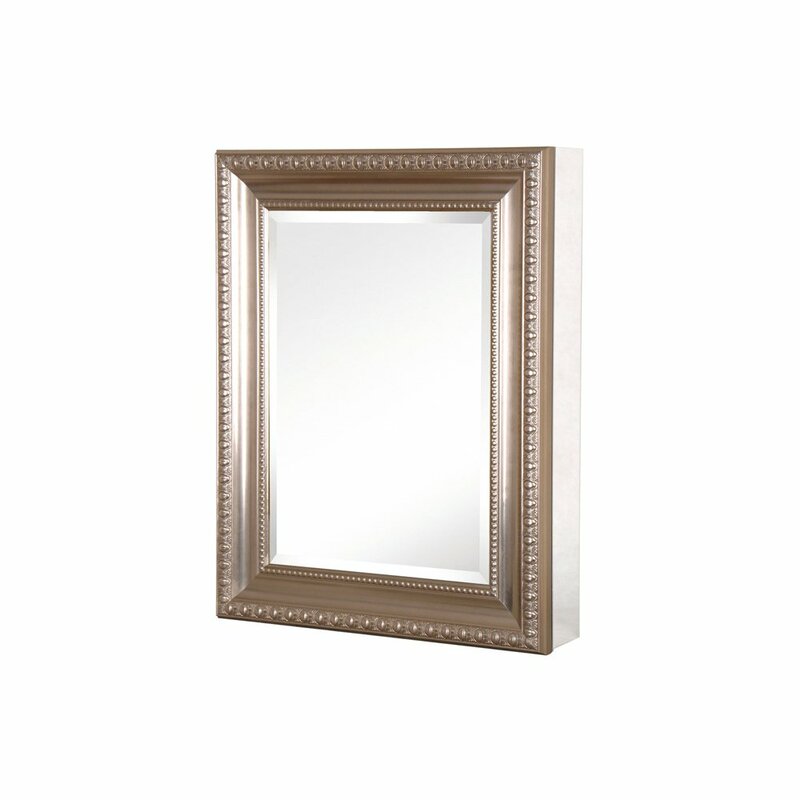 Behind a smooth surface door is a mounted mirror as well as at the back of the cabinet. Like many of its counterparts it is also fitted with 2 shelves of tempered glass that create visibility in the cabinet. For a recessed installation, your contractor will need to create an opening the wall of about 3 5/8 inches deep, 14 1/4 inches wide and 25 1.4 inches high for a perfect recessed fit. Alternatively this unit cab be surface mounted. Hardware to facilitate either installation is included in the unit. Consumers loved the size of this unit because it offers a bit more storage. This octagon medicine cabinet features a frame-less surface that is elegant to add style to your bathroom while helping create hidden storage for all those small bottles that take up counter space. The door’s hinging is the continuous piano hinge and can be installed on either side of the cabinet depending on bathroom space. 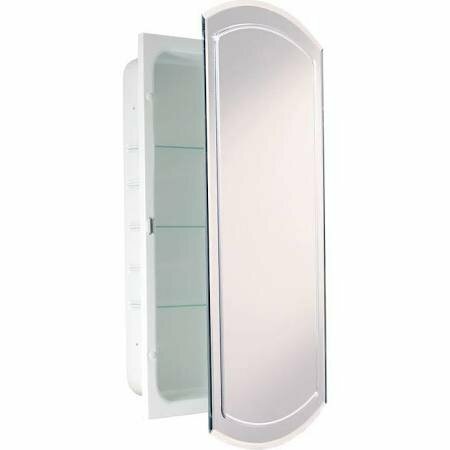 The inlay of the door is a full beveled mirror of good quality while the interior has two adjustable plastic shelves for storage of medicine bottles and toiletries. The exterior of this cabinet is made from rust proof welded steel and painted over by acrylic paint for a nice finish and durability against the moist bathroom environment. This unit design is a recessed mount and requires your contractor to make a wall opening of roughly 3 1/2 Inch depth, 14 inches width and 18 Inches high. Consumers loved the unique octagonal design which is very elegant. 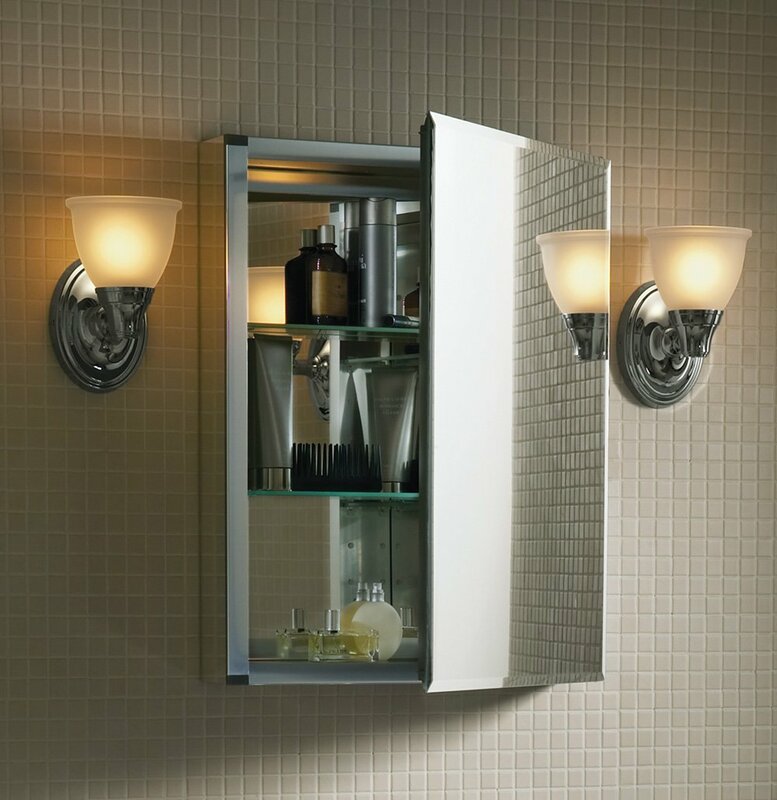 This recessed medicine cabinet is crafted for space as well as seamless integration into a contemporary bathroom decor. You will also notice that the interior is roomier with 3 tempered glass shelves and a beveled mirror inside the front door. The exterior is constructed from aluminum thus making it rust proof while the edges are protected from chipping. An opening in the wall of about 14 1/8 Inches by 25 1/8″ and 3 7/8″ depth is sufficient. This product can be mounted recessed or the surface. Consumers love the roomier aspect of this unit because it offers more storage. The curved top and bottom of the door give this cabinet a stylish design. The exterior is thoroughly protected from rust and chipping due to use of generously powder coated galvanized steel. The cabinet door can be installed on either left or right depending on spacing aspects of your bathroom and will require an opening of roughly 14 x 24 inches for a recessed fit. The interior comes with full inlay glass on the inside of the surface door and 3 adjustable tempered glass shelves. Consumers loved this product’s curved design aspect on the door. It gives it the elegance and uniqueness that makes it stand out. Style and quality co-exist harmoniously in this unit. 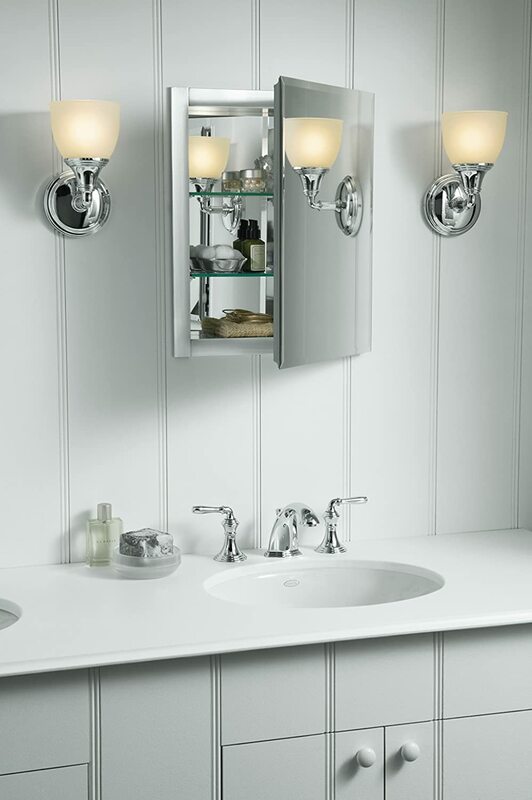 It is sure to inject charm and elegance into your bathroom. The shiny aluminum exterior surface looks like a mirror and the detailing is done using oiled rubbed bronze for an exquisite finish. 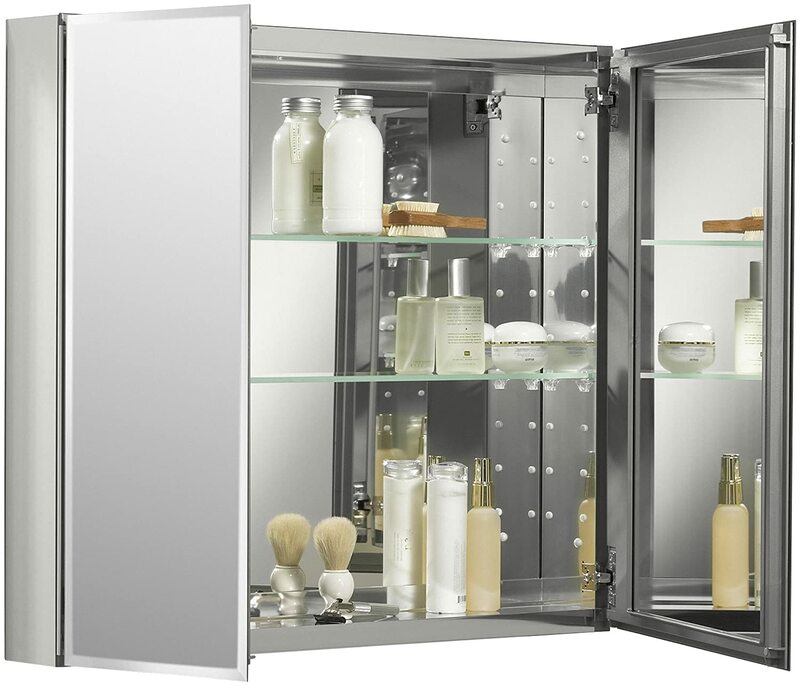 The interior is fully mirrored for good visibility in addition to 3 tempered glass adjustable shelves to suit the size of different containers and other medicine bottles and toiletries. Your contractor would need a wall opening of 19 1/4 inches wide, 25 14 inches high and 3 5/8 inches deep in order to have this cabinet recessed. Alternatively, it can be mounted on the surface. Customers love the stylish exterior because it adds character to the cabinet and by extension the bathroom. 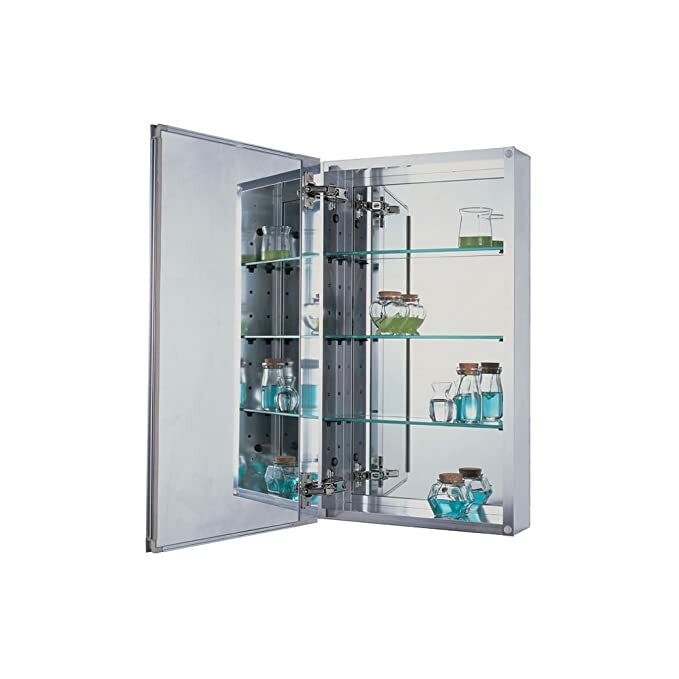 If you would like your medicine cabinet bigger, then you are likely to appreciate the design and space that this product offers. The cabinet door is reversible and can be installed on the right or left. The cabinet case is constructed from anodized aluminum for durability and protection from rust and prevent chipping on the edges. On the interior it has been fitted with two adjustable tempered glass shelves and is fully mirrored for excellent light reflection and it It can be mounted on the surface or recessed which would require a 29 1/4 inches wide x 25 1/4 inches high x 3 5/8 inches deep opening on the wall. Customers love the fact that this cabinet is versatile when it comes to storage. It can take bigger containers with the same ease it does smaller ones. The design on this cabinet incorporates high white frames on the surface exterior exuding classic, traditional elegance. The exterior is constructed from rust free aluminum, with the frames designed high. The contrast on this cabinet is beautiful. The euro 6-way adjustable hinging system ensures the cabinet door closes slowly and softly every time. The interior is fully mirrored with a full bevel edge mirror as well as 2 adjustable tempered glass shelves. Depending on how you like the medicine cabinet mounted, you can opt for recessed or surface mount. Customers love how it oozes old school charm and elegance. Before you buy a medicine cabinet, like everything else, shop around first as medicine cabinets are designed differently, with some being capable of withstanding the humid bathroom environment better than others. Furthermore, some come with additional features like LED lighting, mirrors and expansive customizable storage spaces. Also, take into consideration the size and how deep you want your cabinet to be as some options in the market are quite shallow and therefore will not allow storing of other items such as toiletries like tissues rolls and other big items. 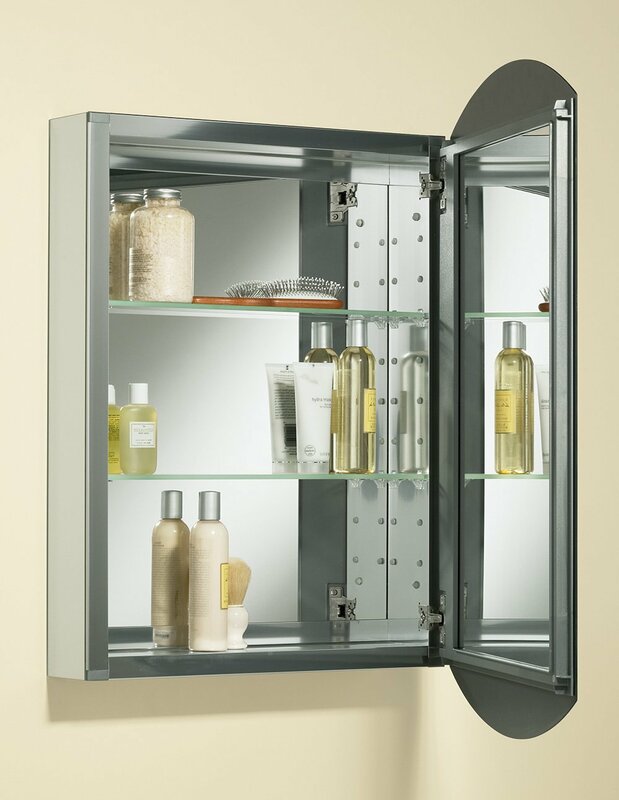 At the end of the day, the best bathroom medicine cabinet for you will be determined by your bathroom needs.